Downtown revitalization doesn't have to be difficult. Adding life, excitement and economic opportunity isn't about spending tons of money or subsidizing companies to relocate. In many cases it's as simple as taking advantage of what you already have. Here’s a one block space in the heart of the city that is totally under utilized, despite being surrounded by occupied businesses and just as authentic of a spot that you will find anywhere in the city. 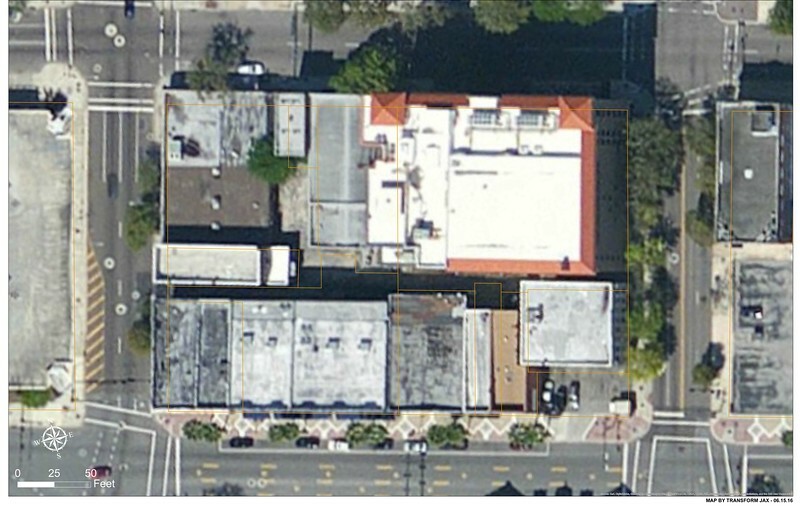 If you can’t recognize the location in the image, it’s the alley of the block bounded by Bay, Ocean, Forsyth and Liberty Streets. It’s one of a few blocks left in the Northbank featuring a collection of unique early-20th century brick buildings as opposed to surface parking lots, bland stucco and modern office towers. Better yet, it’s in the heart of downtown’s burgeoning Elbow entertainment district. It’s not a place of if you build it, they will come. The graphic below indicates “they” are already there but just not seamlessly connected. Highlighted in blue, green and magenta, nine spaces are restaurants, craft breweries and bars. 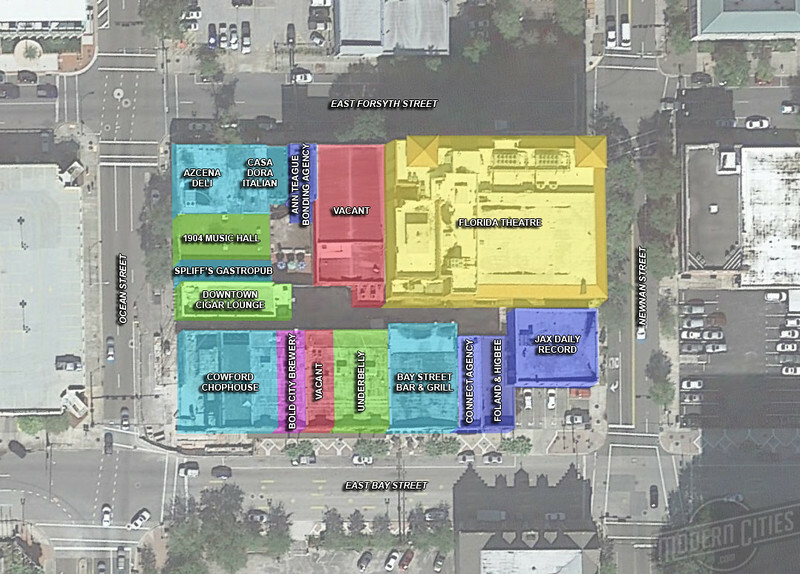 The block’s entertainment anchor, the Florida Theatre, is highlighted in yellow. There’s also no need to devise a plan too difficult to actually achieve because there’s nothing is new under the sun. However, property ownership is one challenge that must be overcome for something to happen with this particular alley. 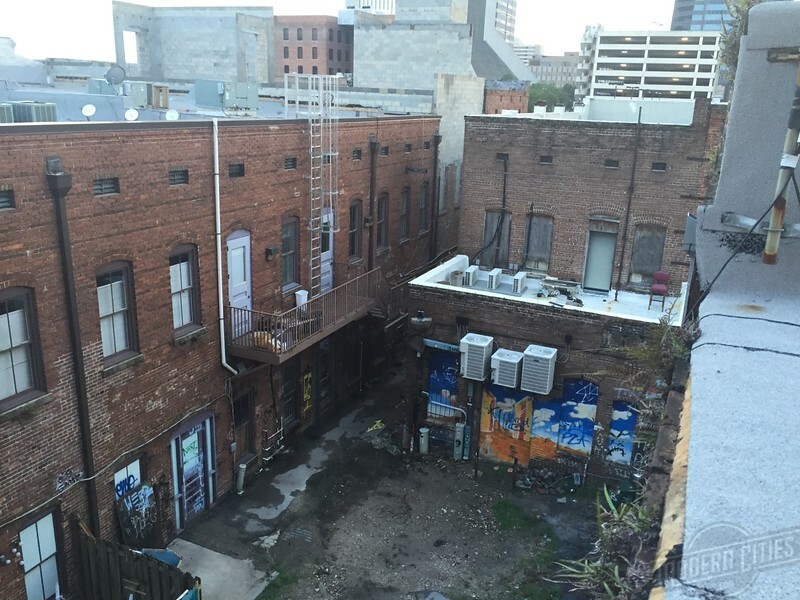 Unlike most, a large portion of this alley is not publicly owned and despite several properties having access to the alley, a significantly smaller number have actual ownership of the space. Next, a discussion on potential challenges of properly utilizing this space for public use as well as local solutions that can overcome these obstacles.